Now that you have the big gifts out of the way, what will you put in her stocking? When it comes to stocking stuffers, think small--not to be confused with inconsequential. The best things come in small packages remember? There are a variety of fun and pint-sized gifts that will fit in her stocking, or you could surprise her by planting a “big” gift, like a pair of diamond earrings, as a stocking stuffer. You hear about all the great holiday sales but there are either already over or you have 24 hours to rush to your local mall and buy, buy, buy. With everything else going on around the holidays, isn’t a little extra time always appreciated? Stumped over the perfect gift? Give the gift that gives your gal pals an excuse to shop and removes any trace of buyer's remorse. 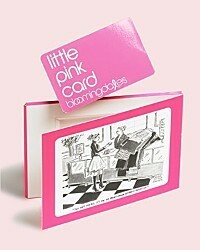 Bloomingdale's teamed up with cartoonist Marisa Acocella Marchetto to create Little Pink Gift Cards, with exclusive (and stylish) package art. Not only are the gift cards cute, they really are the gift that gives twice. When you buy a Little Pink Gift Card, 10 percent of the card value is donated to The Breast Cancer Research Foundation® (BCRF). Then when the gift card is redeemed, and the recipient spends more than the card value, 10 percent of that amount (excluding sales tax) will also benefit BCRF.